The Chelsea tall mono basin mixer with straight spout from Burlington features a traditional design, manufactured to the highest standards using the latest technology. Tall mixer taps have been specifically designed to be used with countertop basins with no tap holes and provide a different alternative to wall mounted taps. 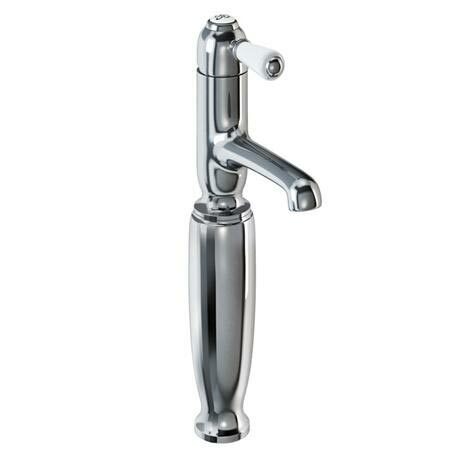 All Chelsea taps have a ceramic lever tap head with a ceramic indice in the centre. Complete a timelessly traditional look with the Chelsea tall basin mixer from Burlington. It is made with a brass interior making it robust and durable to withstand the daily uses of the bathroom and has been finished in polished chrome for the finer touches of style. Burlington are at the top end of traditional bathroom items and this tap is the perfect example of their experience in craft.